The primary GHGs are water vapour and the much-debated CO2. Carbon dioxide contributes up to 30% of the total greenhouse effect, water vapour provides about 70%. CO2, though, has overall warming power that water vapour doesn't. Water vapour in the atmosphere has a very short residence time (from hours to days) and its concentration can increase only if temperature increases. CO2 lingers in the atmosphere for 100 years and its concentration is not solely controlled by temperature. CO2 is thus able to trigger warming: if CO2 concentration increases, the average temperature, regardless of its own trend, will increase. It is thus crucial to understand how atmospheric CO2 is regulated. Over geologic time-scales (100,000+ years), volcanic gasses are the primary source of CO2, averaging 0.4 billion of tons of CO2 per year (0.4 GtCO2/y). But CO2 doesn't just endlessly accumulate in the atmosphere, it fluxes in and out thanks to other environmental processes, and is stored in reservoirs known as carbon sinks. The ocean, for one, contains 50 times more carbon than the atmosphere. 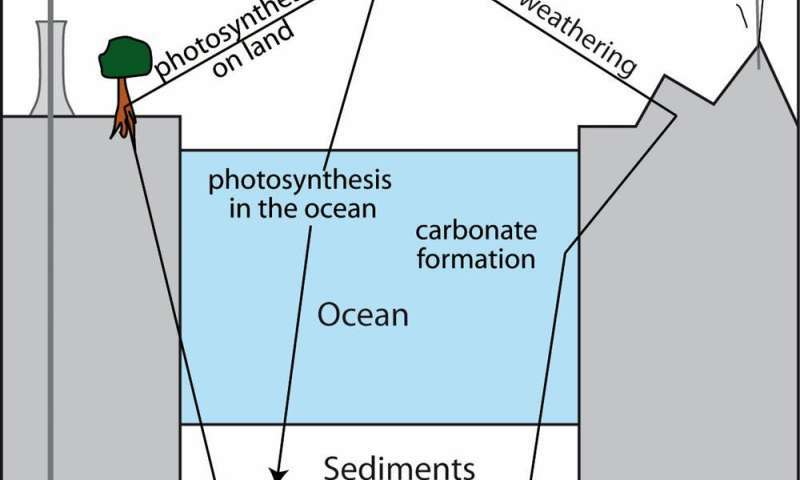 However, CO2 dissolved in the ocean can easily be released toward the atmosphere, while only geological sinks keep CO2 away from the atmosphere on geological time-scales. The first geological sink is sedimentary organic matter. Living organisms contain organic carbon built from atmospheric CO2 through photosynthesis, and dead organisms are often sent to the bottom of the ocean, lakes, and swamps. Immense amounts of organic carbon thus accumulate over time in marine and continental sediments, some of which is eventually transformed into fossil fuels (oil, gas and coal). The amount of CO2 in the Earth's atmosphere has varied widely. Decades of research allow us to draw the main lines of the history beginning after the Earth was fully formed 4.4 billion years ago. Earth's early atmosphere was extremely rich in CO2 (up to 10,000 times modern levels), while oxygen (O2) was scarce. During the Archean (3.8 to 2.5 billion years ago), life first flourished, the first continents built up. Weathering started pulling CO2 out of the atmosphere. The development of photosynthesis contributed to decrease atmospheric CO2, while elevating O2 levels during the Great Oxygenation Event, about 2.3 billion years ago. CO2 concentration fell to "only" 20 to 100 times the preindustrial level, never to return to the concentration of Earth's earliest eons. Two billion years later, the carbon cycle changed. Toward the late Devonian-early Carboniferous (~350 million years ago), CO2 concentration was around 1,000 ppm. Mammals didn't exist. Vascular plants able to synthesise lignin appeared during the Devonian and spread. Lignin is a molecule resistant to microbial degradation that allowed massive organic carbon stocks to build up as coal over millions of years. Combined with the weathering of the Hercynian range (the vestiges of which can be found in France's Massif Central or the Appalachians), organic carbon burial pulled atmospheric CO2 down to levels similar to (or lower than) today's and generated a major glacial era between 320 and 280 million years ago. By the end of the Jurassic (145 million years ago), however, the pendulum had swung. Dinosaurs ruled the Earth, mammals evolved, tectonic activity increased and Pangea (the last super-continent) dislocated. CO2 increased, to 500 to 2,000 ppm, and remained at high levels, maintaining a warm greenhouse climate for 100 million years. From 55 million years, Earth cooled as CO2decreased, notably following the Himalayan uplift and a subsequent increase in weathering and organic carbon sedimentation. Evolution continues with Hominids appearing 7 million years ago. At 2.6 million years, Earth entered a new state characterised by an alternation of glacial and interglacial periods at a regular pace led by Earth's orbital parameters and amplified by the shorter term carbon cycle. CO2 reached its preindustrial level 11,500 years ago as Earth entered the latest interglacial stage. Until the 19th century, the story of atmospheric carbon and Earth's climate was a story of geology, biology and evolution. 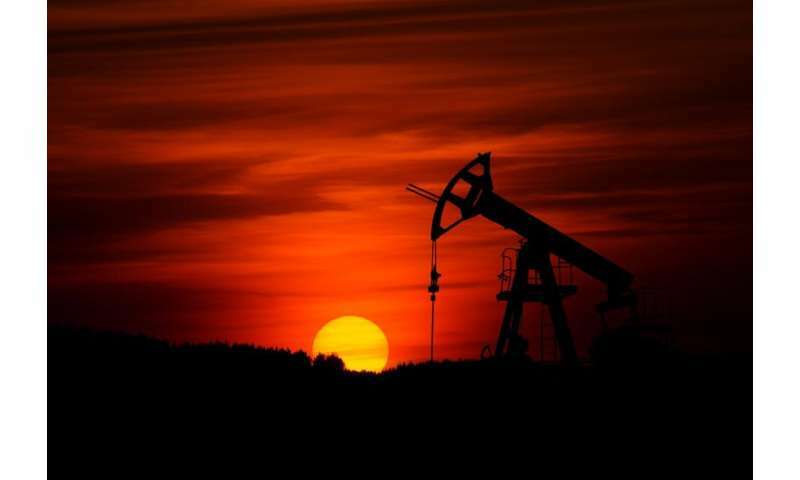 That story changed sharply following the Industrial Revolution, when modern humans (Homo sapiens), who probably appeared 300,000 years ago, began consuming fossil fuels on a massive scale. By 1950, the addition of CO2 to the atmosphere through fossil-fuel combustion was already proven, via the carbon isotopic signature of CO2 molecules ("Suess" effect). By the late 1970's, climate scientists observed a rapid drift toward warmer overall temperatures. The IPCC, created in 1988, showed in 2012 that the average temperature had increased by 0.9°C since 1901. It continues to climb. That change might seem modest compared to the last deglaciation, when average temperature increased by about 6°C in 7,000 years, but it's at least 10 times faster. Natural parameters such as solar activity or volcanism can't explain such a fast warming. The cause is unambiguously human addition of GHGs to the atmosphere, and high-income countries emit the most CO2 per inhabitant. Industrial societies burnt about 25% of Earth's fossil fuels within 160 years and abruptly inverted a natural flux storing carbon away from the atmosphere. This new human-generated flux is instead adding 28 Gt of CO₂ per year, 50 times more than volcanoes. Natural geological sequestration cannot compensate and atmospheric CO2 keeps rising. The consequences are imminent, numerous and dire: extreme weather events, sea-level rise, glacier retreat, ocean acidification, ecosystem disruptions and extinctions. Earth itself has survived other catastrophes. Although current warming will outpace many species' ability to adapt, life will continue. It is not the planet that is at stake. Instead, it is the future of human societies and the preservation of current ecosystems. Stop trying to whitewash the blame that belongs squarely to psychotic industrialists, avarice-poisoned oligarchs, sociopathic corporations and financial institutions, and corrupted politicans. As for the rest of us, none of us consented to this, none of us asked for this, none of us deserve this. Our world was hijacked and held hostage and only someone with clinical Stockholm Syndrome could be confused about where responsibility and accountability for this crisis truly belongs. Now, it's long past-due time time for a reckoning. Yes, a great many of us would welcome a carbon tax and other policies to help prevent this disaster. However there are also too many who don't seem to appreciate science, despite the technological gifts it has given us and therefore simply don't believe it's happening. At school Science should be the most important subject of all. Nice walk through, but I am not sure I care for the softening to "imminent", likely due to US politicization of the area. People have died due to AGW since the 00's (attributed heat waves) and currently millions of people are directly worse affected (not yet AGW attributed - if ever - but known to result in increased severity of current floods in US and Africa, the latter now affecting 2 million people - oh, and killed another 1,000 too). Also, unavoidable erroneous details in a vast area. The Earth was "fully formed" to mass 4.6 billion years ago [Ga], it was the global ocean that arose before 4.3 Ga. Also, some papers claim that ocean weathering is enough for CO2 regulation, it is rather the continent cycle that have at times caused glaciation. And land plants recycle 100 times as much biomass as ocean life, which may be more important than the sedimentation type.